The Magen David is an all-inclusive symbol, representing all Jewish people, so why not purchase this unisex Star of David pendant? Also incorporating a Chai motif, this pendant is meaningful and versatile and will impress wherever and whoever you are. This is the ultimate in versatile and stylish Star of David pendants. While some pendants are clearly targeted to exclusively male or female audiences, this item of Jewish jewelry has a timeless quality to it, which makes it an excellent item for anyone. The solid sterling silver frame is a classic design with a sophisticated feel. 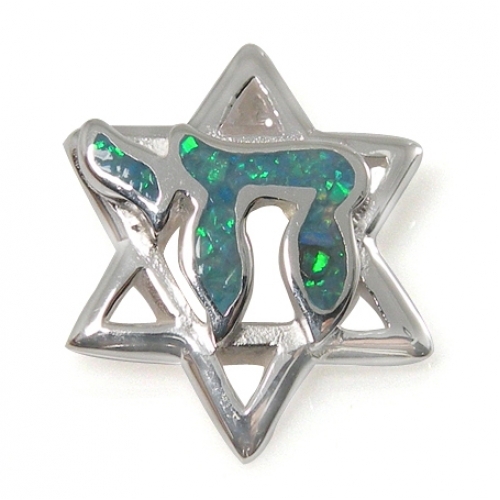 It is complimented by a beautiful Chai symbol, formed out of striking blue and green opal. Together, it forms one coherent and eye-catching pendant, which is suitable for anyone on any occasion. Measuring 16.0mm x 19.4mm, it is a pendant that will catch the eye for all the right reasons. This pendant is also a wonderful fusion of two classic Jewish symbols. The Jewish Star of David is perhaps the oldest and certainly the most recognizable symbol representing the Jewish people and its long history. Meanwhile, the Chai, which is the Hebrew word for life, represents the eternal hope of the Jewish people towards the future. As such, this is a unique Star of David pendant, which will undoubtedly represent so much to all those who decide to wear it. At the same time, it is also a wonderful addition to anyone’s jewelry collection.